On very chilly and breezy Saturday, Scouts and leaders bundled up and joined with other community supporters by volunteering their time in support of the The Kevin Bell Memorial Blast & Cast, a fundraising event held annually that includes a variety of marksman and outdoor sports events in a four-person team, round-robin format. This year's event marked the second year the troop assisted with the event by staffing tomahawk-throwing and slingshot-shooting stations. Other events included various rifle-, shotgun-, and pistol-shooting stations, as well as a knife-throwing station. Highs for the day barely reached the 50s, but with the constant winds throughout the morning, temperatures felt more like the mid-30s through the mid-40s during most of the 8 a.m. to 2 p.m. event. 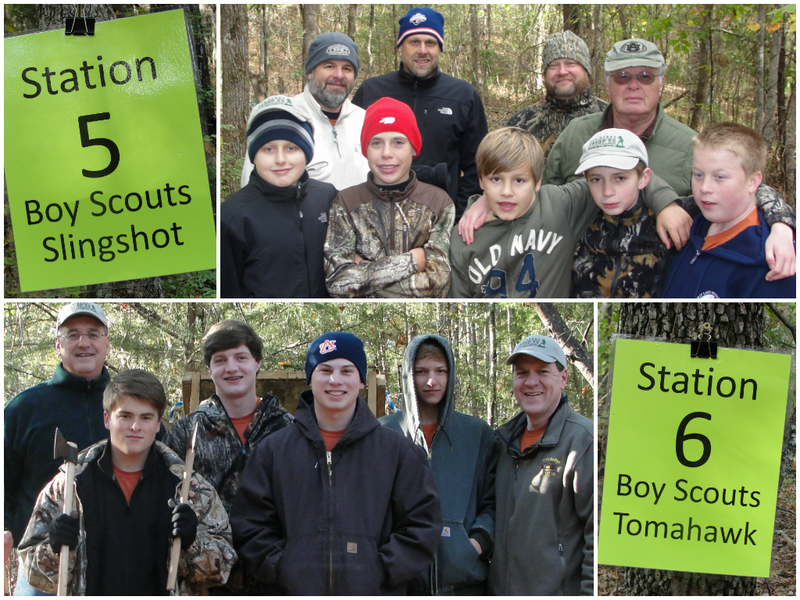 At the troop's slingshot event, teams tested their marksman's skills shooting both slingshot marbles and paintballs at various stationary and moving targets. Not only were some targets in excess of 20 feet away, many also required careful aim past trees and through branches to score points. Scouts served as "caddies" to each shooter by holding their slingshot ammunition as well as keeping each shooter's score. At the tomahawk station, teams demonstrated their ability to not only hit a stationary target roughly 12 feet away, but with the precision and force required to cause the tomahawk to stick. Scouts assisted teams by retrieving thrown tomahawks and offering tips on throwing techniques. Those suggestions must have worked, as two participants each hit bulls-eyes five times in nine throws. The event raises support for the Kevin Bell Memorial Scholarship Fund, which awards scholarships to deserving Auburn High School students pursuing degrees at Auburn University. The event and fund's namesake, Kevin Bell, passed away in 2010 at the age of 29 after a 22-year battle with Friedreich's Ataxia, a neurological disorder which robbed him of the ability to walk and write by age 11. Having earned two degrees at Auburn and serving as a substitute teacher at Auburn High School, family and friends chose to create scholarships in his name as a means of perpetuating Kevin's own love of education. After the proceeds from past Blast & Cast events endowed a scholarship at Auburn University in 2012, the Blast & Cast began in 2013 to fund scholarships awarded by the Auburn Veterans Committee and benefiting veterans or their dependents pursuing degrees at Auburn-area post-secondary educational institutions. For more information about the scholarship fund, visit the fund's page on Facebook. For more photos from the event, visit the troop's online photo album.